• Bus GPS app with turn by turn motorcoach driving instructions. • Daily updated Bus maps and routes. Drive with confidence. • Bus specific routing avoids low bridges to safely deliver passengers on time. It is easy to get the SmartBusRoute GPS routing app on your phone or tablet. Select your choice below. Subscription rates are one time payments, there are no recurring fees. Rates will be given on the page before you are asked to pay. The best plans work out to a few cents a day to have reliable coach bus routes and navigation on your phone. Once you finish your purchase your subscription is active. Purchase the Android SmartBusRoute GPS app with a one time payment using your credit or debit card. You can download the app from Google Play at your convenience either before or after purchase. No account setup required. Purchase the Apple iPhone SmartBusRoute app with a one time payment using your credit or debit card. You can download the app at your convenience from iTunes either before or after purchase. No account setup required. Thank you for your interest in purchasing SmartBusRoute coach bus routing GPS for your Android Smartphone or Apple iPhone. If you need assistance, call 617-542-6220. Reliable Bus Routes on your Android Smartphone, Tablet or Apple iPhone or iPad! The SmartBusRoute app provides a reliable route that is specific for driving a Recreational Vehicle and helps you stay safe. The SmartBusRoute coach navigation app is easy to use, just speak or type the destination, within seconds you'll have a bus specific route with turn by turn directions that avoid low bridges and uses RV friendly roads. Specify your Bus dimensions and weight, even your hazmat level for the most accurate route. Choose regular street map view or navigate with satellite images for a more realistic view. SmartTruckRoute offers route choices helping you arrive to your destination on time and within budget. Stay safe and save money with SmartTruckRoute for your Android smartphone, tablet, or iPhone. Free to download and view map, paid subscription for routing. Free trial use between 1-2 PM and 1-2 AM Eastern time daily. Pricing information is available in the section marked "Pricing Plans & Purchase". The subscription is a one time fee which does not recur. You will be billed only once at time of purchase. SmartBusRoute is powered by WorldNav, pioneers in Bus routing and navigation for portable GPS's. The development was further adapted to support coach and bus drivers. • Navigate Coach buses with the convenience of using your phone or tablet! • Offers the latest Bus specific maps and routes. • Set Route Preferences for the most economical or scenic routing. • Enter bus specifications to match the exact weight, and height of your vehicle. WorldNav Truck GPS and SmartTruckRoute Truck navigation app have been featured by National Public Radio and ABC News. Listen to the news clips by clicking on the images below. 07/08/13 - SmartTruckRoute for iPhone Version 2 now offers the commercial driver truck specific points such as truck stops, weigh scales, weigh stations, rest areas, truck parking, and more. Diesel fuel pricing is also shown on the map in real time. The Odometer function provides state mileage useful in calculating fuel taxes. #1 electronic driver log app on Google Play! #1 rated trucker, truck driver log books, trucking app on Google Play as well!. KeepTruckin is the #1 driver logbook for Android! Track your daily HOS driver logs on your phone or tablet for FREE! Show your exact location to your family and friends on Google Maps for free. This is more than a GPS Tracker, this is real live tracking for location sharing. Your friends can also show their location to you. Note: You can locate your friends only if they are running this app. The SmartBusRoute app is developed by TeleType Co which has over 20 years experience in the GPS industry. 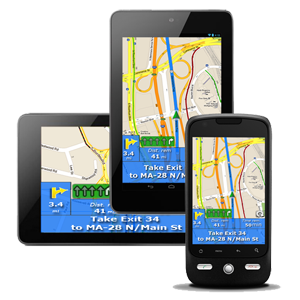 SmartBusRoute bus navigation app is developed by TeleType Co which has over 20 years experience in the GPS industry. Founded in 1981, TeleType Co., Inc. is a software development company based in Boston, MA. Building on over 30 years of experience, TeleType has developed SmartTruckRoute, SmartBusRoute, and SmartRVRoute GPS routing apps specifically designed to make driving large vehicles easier, safer, and more economical. TeleType specializes in software system integration and has produced cutting edge products in a variety of industries. TeleType’s award winning GPS solutions include support for embedded mobile devices, portable vehicle navigation, commercial navigation systems, and fleet tracking.